Recently, the folks at 10DollarMail contacted me and invited me to experience their website, which specializes in low-cost apparel, shoes, jewelry and accessories for women. In fact, everything on the site is priced at $9.99 or less. I was intrigued and wondered: Is it possible to get good quality fashions at such a low price? After a perusal of the site's merchandise, which includes Plus sizes, I accepted the invitation to review the shopping site. To experience the website, I order the Woven Straw Camel Bohemian Shoulder Bag, using a $9.99 gift certificate provided by 10DollarMail. In the summertime, I like to carry a straw bag on the weekends; straw is a casual and fun look. Plus, a big straw bag is handy for shopping, especially at the farms on Long Island's North Fork. 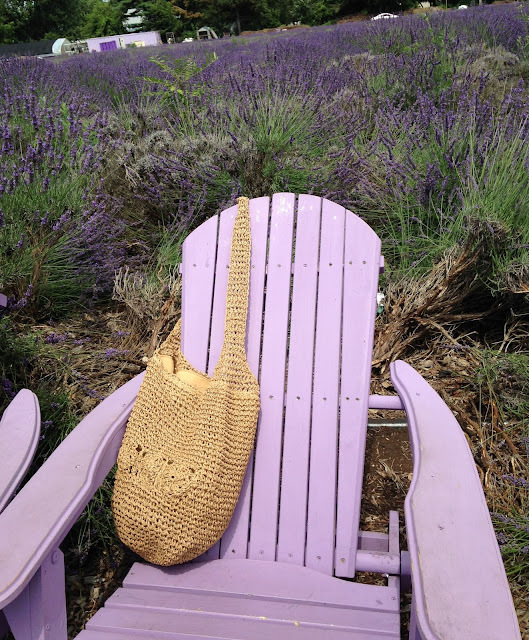 To test out the 10DollarMail straw bag, I carried it on a recent trip to Lavender by the Sea, a lavender farm in East Marion (see photos). I'm constantly encouraging Flattering50 readers to avoid buying lots and lots of low-cost garments and accessories, and instead, spending a little more on a few more expensive, better-quality pieces. However, I also believe the over 50 woman can stretch her fashion budget by mixing in a low-cost item of good quality when styling an outfit. The key, of course, is the quality of the low-cost item. According to its website, 10DollarMail is able to offer good quality, low-cost apparel and accessories because of its unique business model, which allows the site to purchase limited quantities of overstock inventory at heavily discounted prices. By cutting out wholesalers and distributors, the site says it can pass on great deals to customers. However, the proof, as they say, is in the pudding. I couldn't wait to see what the straw bag I ordered actually looked like up close. My initial reaction after removing the straw bag from the shipping material was amazement. I was honestly amazed by the low-cost bag's quality. It is fully lined and has a small pocket (perfect for holding my cell phone) and a magnetic closure. Still, I wondered: How would it hold up when used? 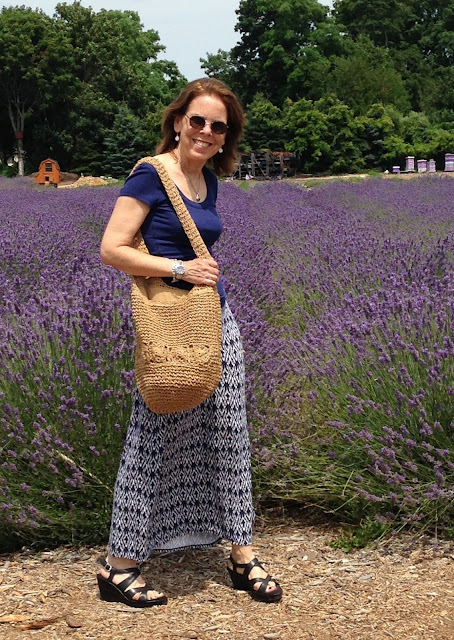 Yesterday, I used my new straw bag on a trip to the lavender farm. It's impossible to visit the farm without stocking up on its many lavender-based products for myself and for gifts. I'm happy to report that the straw bag held up beautifully under the weight of jars of honey, soaps, and tins of hand balm. Unfortunately, I can't share the link to my straw bag. It's no longer available. Again, the site keeps prices low by offering limited quantities and continually adding new merchandise. I also can't speak to the quality of all the apparel and accessories on the site. However, I am very pleased with my straw bag. In fact, I'm planning to buy the Tiny Leaves Pajama Bottoms for $9.99 next. Naturally, quality is super important when shopping. However, a shopping site's functionality is also very important to me. The 10DollarMail site is very responsive, making it quick and easy to look through the collection. Plus, when ordering, the site accepts PayPal as well as major credit cards. And the ordering process is handled on secure webpages. For all these reason, I believe 10DollarMail is a site worth checking out.